Steve has been a lifelong resident of Northwest Iowa, growing up in Hull and having attended Western Christian High School. After high school he attended Iowa State University, graduating with a degree in Athletic Training. While at Iowa State, he had the opportunity to work directly with the football team, track and cross country teams, and the wrestling team. 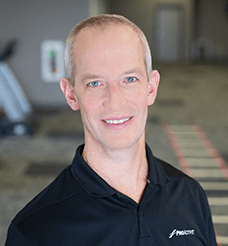 He has been a certified Athletic Trainer for 28+ years and a licensed Physical Therapist for 21+ years. He currently lives in Hull, IA with his wife Kim. He has two daughters, Kiana and Jorji who are both in college. Steve first developed his desire to help those around him while being a student manager in high school. This passion continued to develop with his education at Iowa State and then working in Physical Therapy for 4 years before continuing his education at St. Ambrose University for his Master of Physical therapy degree. He continues with his certification and license in Athletic Training including working with local athletes with time spent at Sioux Center Community School and Western Christian High School sporting events. He also has background with Titleist Performance Institute, NASM with Performance Enhancement Specialty as well as Dry Needling. I enjoy the opportunity to serve those who have suffered an injury or setback and help them return to their potential and more enjoyable life. I would like patient to feel they were treated as a person with an injury or limitation not a body part / injury with a name. I enjoy spending time attending sporting events (in addition to the ones involved in my work). I enjoy being able to make time to travel and look forward to the possibility of more in the future.